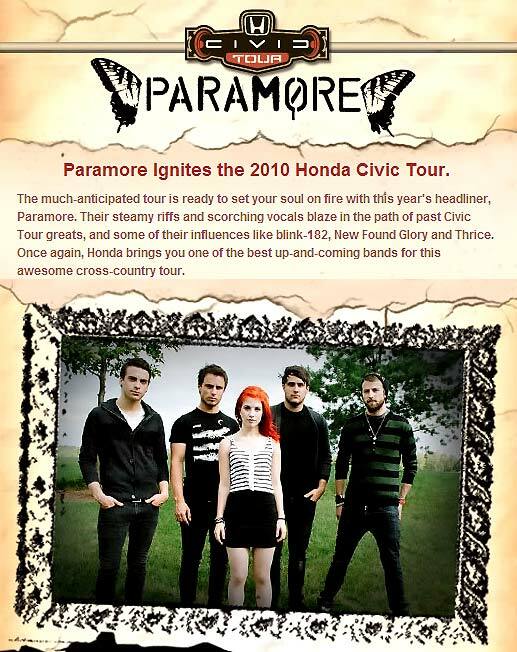 The 2010 Honda Civic Tour Ignites with PARAMORE… The legacy of the Honda Civic Tour burns bright, and Paramore is the latest band representing the roots of the music that started it all. Since the tour’s inception in 2001, powerful acts like blink-182, Incubus, New Found Glory, Good Charlotte, Black Eyed Peas and Fallout Boy have rocked audiences across the U. S. Some of the greatest bands of the last decade have passed the torch year to year, and history is still in the making. In addition to headliner Paramore, the 2010 tour features pop-rockers Tegan and Sara, 2003 HCT alumni and pop-punk quintet New Found Glory, and Sri Lankan/Swedish group Kadawatha. The Honda Civic Tour (HCT) is giving excited fans, music lovers and everyone else under the summer sun a chance to win a Honda Civic Si Coupe customized and autographed by Paramore. This one-of-a-kind car will be on display at each stop of the nationwide Honda Civic Tour. Beginning April 15, fans can enter to win this Honda ride of a lifetime by visiting www.HondaCivicTour.com. Attendees can also register to win at each stop of the tour. Since the Honda Civic Tour's inception, the customized Honda Civic has been an integral part of the traveling rock extravaganza.